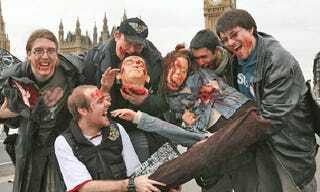 To promote Resident Evil 5's launch, phony body parts were strew around London's Trafalgar Square. Apparently it was a success, save for one problem. The body parts are very realistic and we don't want people to be alarmed by them. They've all been taken from their original positions, but we now have no idea where they are. If you have them, please either return them, or dispose of them in a responsible and careful manner. In addition, chicken livers were used for added gore, and, uncooked, they can be dangerous. SO DON'T PUT THEM IN YOUR MOUTH.